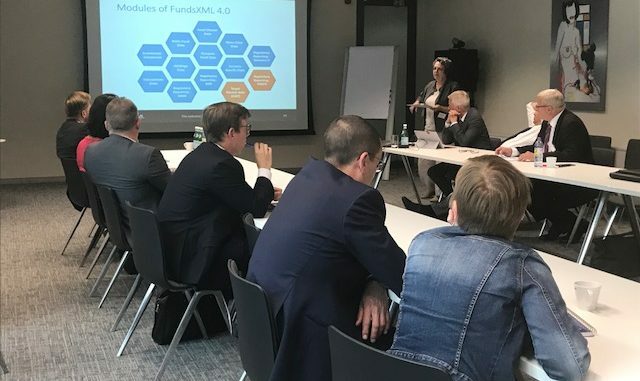 FundsXML met the Luxembourg Fund Industry community on the 13th of June to present status of works and upcoming activities. FundsXML members met Luxembourg Fund Industry community at an event in Luxembourg hosted by KNEIP on the 13th of June. Carsten Lueders, Secretary of the FundsXML Standards Committee, opened up the event presenting the objectives and vision of the data delivery standard FundsXML for the pan-european fund industry. He stressed the benefits of using this standard to achieve efficiencies in communicating fund data between interested partners like Funds Manufacturers, Funds Distributors and Fund Data Providers. Katja Titulski (OeKB) provided insights into the numerous areas of application of FundsXML. She presented the modular concept of the new schema version 4.0 and illustrated the tools for an improved documentation. Fabrice Puziak (KNEIP) gave an update on regulatory reportings and their translation into FundsXML schemas. The focus was on SolvencyII TPT template, PRIIPs EPT template and the upcoming Mifid2 EMT template as discussed at the respective Working Groups on European level. The standardized format FundsXML facilitates to communicate and exchange data between the different partners of the fund market.